Disclaimer: This is a review of a complimentary Franklin Roadie unit. The review that follows are my 100% unbiased opinions. I’m a big fan of taking my music while backpacking so I always bring along my 2 gig iPod shuffle (I know, pretty old school) and a good pair of earbuds. It’s definitely made many flights/bus trips more enjoyable and adds a bit of familiarity in an often unfamiliar world. But sometimes you wish you could impress your fellow backpackers with your awesome taste in music. And to do that, you’ll need speakers. However, there’s a dilemma. If you want good sound quality, you’ll have to sacrifice weight and room. If you go for a small speaker, it usually sounds terrible. Enter the Franklin Roadie. 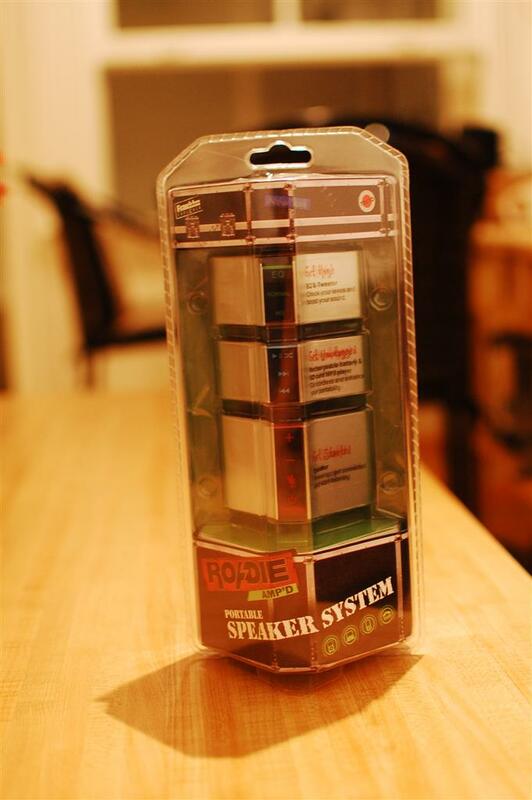 The Roadie is a small, compact speaker system that uses a flat surface as a diaphragm. If you pick it up, you can’t really hear much but once you put it on a table, the sound booms. The unit I received came with all 3 modules: the base that has audio in, mic out and power connections (USB and 12v); a lithium battery and SD card unit; and an “equalizer” that has a small speaker on top. Packaging – Franklin was very travel-minded when they put together this product. Included are a carrying pouch, instructions in SIX languages (English, Italian, Spanish, Dutch, French, German), power plugs for the US/UK/EU and Australia, and the main cable. To make life easier, they bundled the audio, mic and USB cables together so there’s never a mess of tangled wires. Rating: 5/5, incredibly travel friendly, might as well thrown in a few Lonely Planet guidebooks. Build – The Roadie is definitely compact enough for travel. It fits easily in the palm of my hand and although small, feels pretty solid. It could probably handle a few drops but I wouldn’t go around playing catch with it. The main parts are plastic and there’s an outside covering of what looks like aluminum. The individual modules stick together via magnets making connecting and disconnecting them very simple. Rating: 3/5, decent build, a little rough around the edges. Sound – For the Roadie to work properly, you have to put it on a flat surface because sound is created by a vibrating rubber foot. Different surfaces will create different sounds and I found my big wooden table to work pretty well. With just the base, there’s a surprisingly good amount of bass but high tones tend to be pretty distorted: songs sound muffled and you’d think the speaker is underwater. When you add the “tweeter” deck, overall quality improves greatly. A wider range of sounds is back and everything sounds clearer. Even still, I found that a lot of songs had sections that sounded a bit distorted. Rating: 3/5 base only, 4/5 with tweeter. Good bass, can sound muffled, but overall pretty decent for the price and size. In operation with a quarter for size comparison. Pricing – For all three (base/battery/tweeter), the setup costs $100. Buying separately, the base, battery and tweeter go for $50, $40 and $30, respectively. There’s also the option to buy the base and battery for $80. If I were buying this, I’d probably get all three because the tweeter greatly improves sound quality and there will definitely be times when you need a battery. However, Franklin could lower prices to $80-90 as I’m sure the $100 price point will scare away a lot of potential customers. Rating: 4/5, could be a little cheaper. Quirks – I did run into some quirks. Sometimes there’s a buzzing sound when you plug in the audio cord. I also had a really poor experience running off the battery because the cord would become very sensitive and only work (and not too well either) if you plugged it in at a specific depth. Not sure if this is due to a test unit but I found it generally unusuable without the USB power cord or AC adapter. 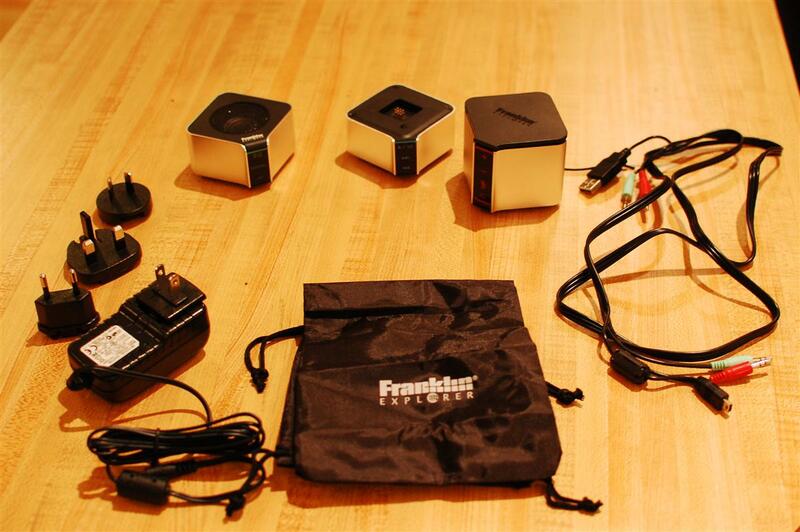 Overall, the Franklin Roadie is a good option if you’re looking for speakers for the road and don’t have much space. 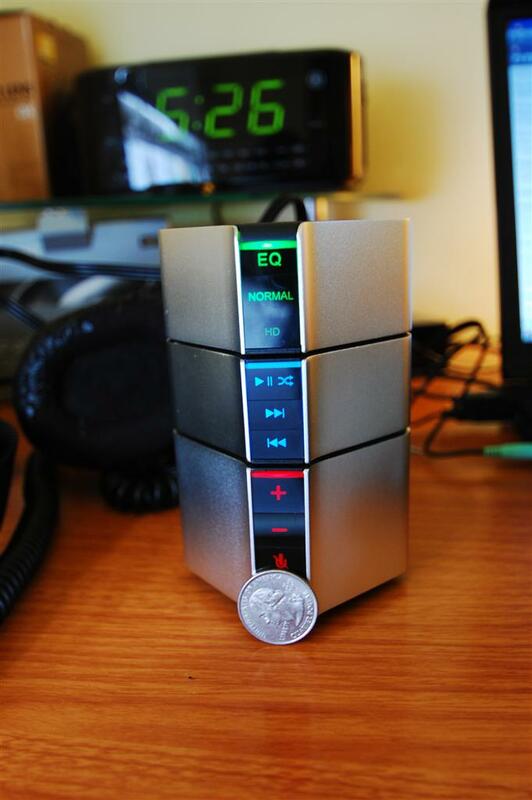 It’s small, compact, traveler-friendly and puts out pretty good sound quality. Hopefully the battery issues are an isolated incident otherwise a large chunk of its versatility would be nulled. I’ll be taking it on my next trip and it’s worth a look if you haven’t bought a travel speaker yet. Nice! I like to take music on my camping trips as well, but adding the weight for such a “luxury” is often a deterrent during backpacking. The price is a little steep (I can think of lots of great, more practical gear I could put that $$ towards) but I suppose it’s a matter of perspective. Yea it is a bit pricey but I think once it comes out and other companies start making their own models, the price should come down.